This fun Christmas party appetizer is easy to whip up. 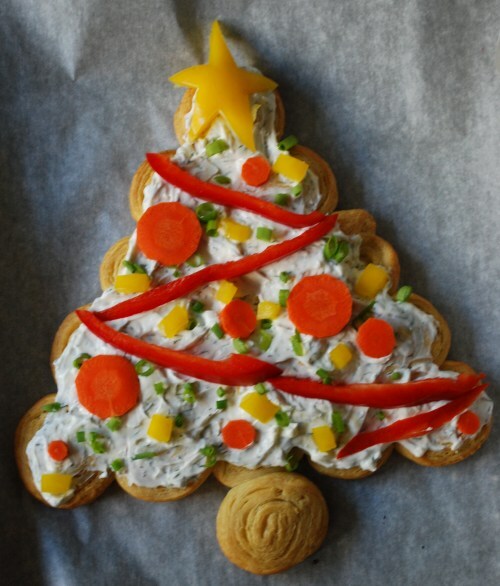 You bake some canned crescent rolls in the shape of a Christmas tree, make the spread that only includes four ingredients that you probably already have in your house, decorate it with fresh veggies, and you have yourself a Christmas tree fresh veggie pizza. Simple, beautiful, and yummy! You can get the recipe for this festive and healthy holiday appetizer over at Make Myself at Home. So glad you liked this! Thanks for sharing it with your followers!